Staying with a friend whose broadband connection was off, so have been trying to access a BTOpenZone. Meanwhile here are the other Wifi networks that came up: Pretty Fly For A WiFi, rubbish, William and Xanadu (plus a few others with default names linked to their sellers). There used to be another one round here, presumably even worse than rubbish. It was called FuckingAnnoying – but this one seems to have dropped off the list altogether now. 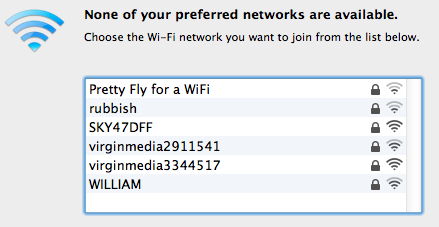 I wonder if it is the same network that mutated into PrettyFlyForAWiFi, and if so what package they are now on?